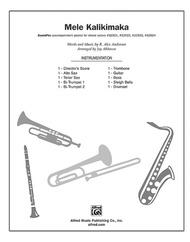 Mele Kalikimaka composed by R. Alex Anderson. Arranged by Jay Althouse. Choir Secular. For SoundPax. This edition: SoundPax. Choral Octavo; Part(s). Pop Choral. Christmas; Multicultural; Secular; Winter. 36 pages. Published by Alfred Music (AP.32926).Grass skirts and coconuts, anyone? Now your men can get in on the act with this popular Hawaiian Christmas greeting, featured on Bette Midler’s album Cool Yule.Inst. Parts Available (choral); Recorded Acc. Available.About Alfred Pop Choral SeriesThe Alfred Pop Series features outstanding arrangements of songs from the popular music genre. These publications provide exciting, contemporary, and educationally-sound arrangements for singers of all ages, from elementary through high school, to college and adult choirs.